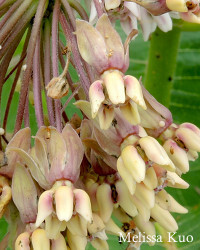 For many who grew up in the rural Midwest, Asclepias syriaca was part of childhood: its interesting purplish flowers, the white milk that is exuded when leaves are broken, the parental cautions not to eat it, the large spiky seed pods, and the fantastic little seeds themselves, with their cottony tails, floating through the clear fall air. 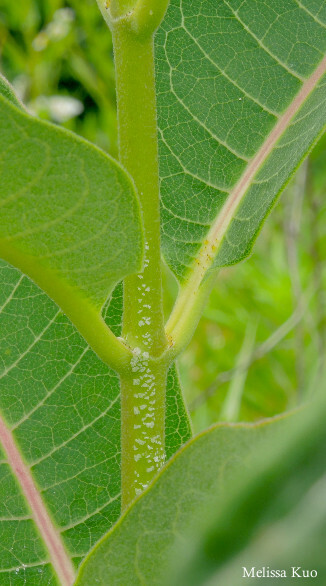 We learned about the common milkweed's role as host for larvae and caterpillars of the monarch butterfly (Danaus plexippus)—and this was, for some of us, our introduction to ecology and conservation. Milkweed populations in the Midwest have declined precipitously—primarily in croplands, as a result of glyphosate weed killers (Roundup and relatives). 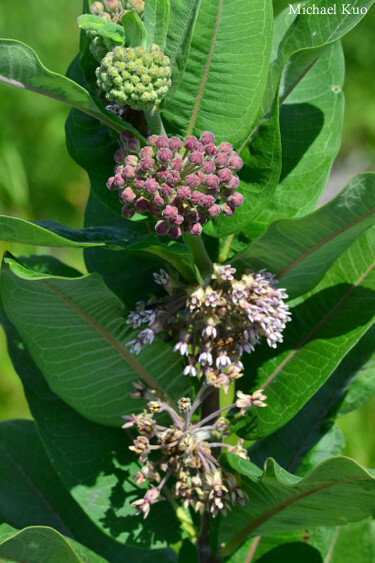 The good news, such as it is, is that a recent study by David Zaya and collaborators (2017) at the Illinois Natural History Survey determined that milkweed populations in natural areas of the Midwest have not fared as poorly. Although recapturing all of the milkweed population lost to agriculture is probably not plausible, the authors conclude that "augmentation of natural areas and the management of existing grasslands, such as less frequent mowing and woody- and exotic-species control, may replace some of the milkweed that has been lost from croplands." 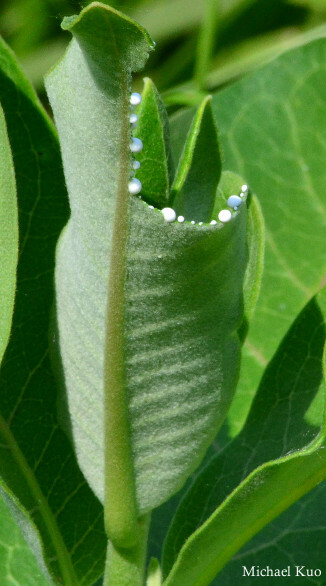 Many interesting insects—aside from monarchs and their caterpillars—are often seen on common milkweed, and some of these are found exclusively with milkweeds; see the photos and descriptions below. Common milkweed is poisonous, according to all of our sources (list below). Asclepias syriaca can be fairly easily distinguished from similar milkweed species with careful observation. 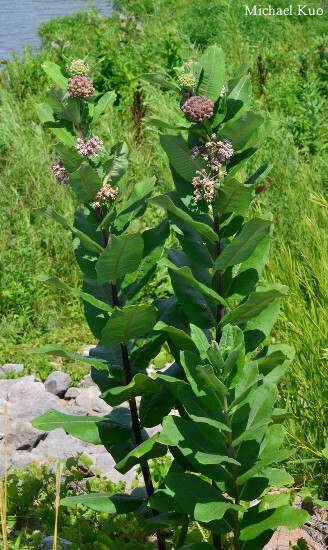 The mature plant is tall—usually in the 3–5 foot range, but occasionally shorter or taller. 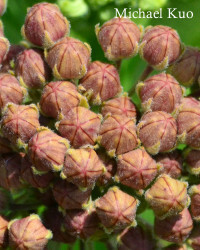 Several to many flower clusters develop near or at the top of the plant; the purplish flowers are "typical" milkweed flowers with "hoods" and "horns" (see illustration) set on bent-back, slightly fuzzy base-petals (corollas) atop relatively long flower-stems. The large leaves are arranged opposite each other on the stem. Each leaf has a prominent central vein, and the base of the leaf is narrowed to a very short leaf-stem. The undersides of the leaves are slightly to moderately fuzzy. 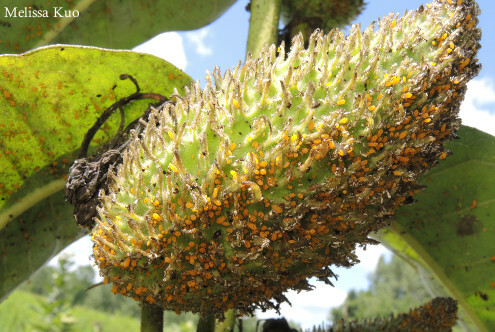 After the flowers mature, distinctive seedpods develop in their place; these pods get quite large by late summer and are covered with soft prickles. Asclepias purpurascens (purple milkweed) is similar but features darker purple flowers with bald base-petals (corollas) that are less prominent; it also usually features fewer flower clusters. 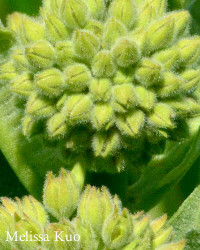 Asclepias sullivantii (prairie milkweed) is also similar; it has leaves with bald undersides and rounded bases and is usually shorter, with fewer flower clusters. Neither of these look-alikes features spiny seedpods. 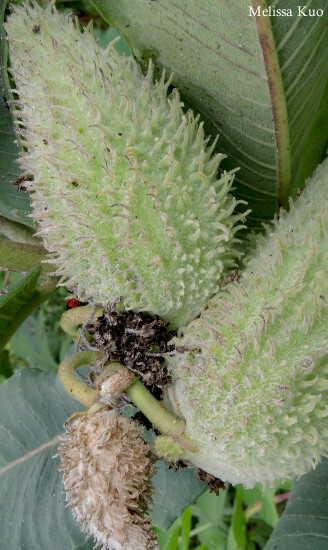 The large milkweed bug (that's its common name, "large milkweed bug") lives on Asclepias syriaca and other milkweeds, eating the seeds and laying its eggs on the seedpods. Adults are orange with black markings, and are about 1–1.5 cm long. 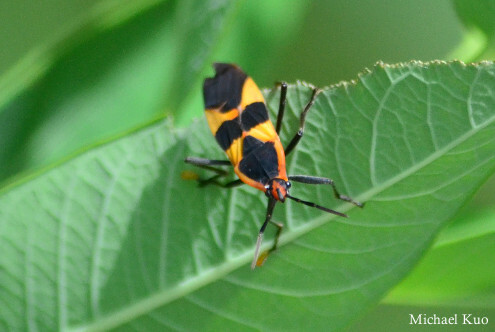 The similar small milkweed bug (Lygaeus kalmii) is more red, and features a red X pattern on its back. 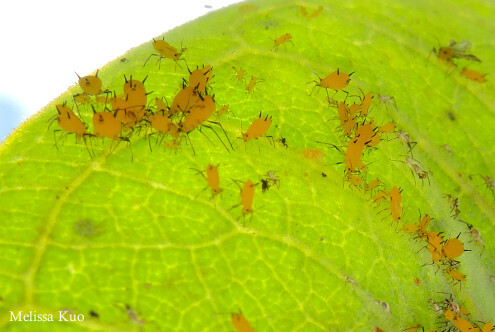 Oncopeltus fasciatus nymphs are orange-red with developing black markings and appendages. Red milkweed beetles are usually about a centimeter long, and feature red bodies with black spots; there are four black dots on the pronotum (the middle section covering the thorax). The appendages are dark gray to black, as are the antennae. Tetraopes tetrophthalmus is almost exclusively associated with Asclepias syriaca, although it is sometimes reported on other milkweeds and on dogbane. um, well . . . The milkweed tiger moth, also known as the milkweed tussock moth, is a medium-sized, boring, grayish brown moth—but its caterpillar, which lives on Asclepias syriaca and other milkweeds, is pretty stunning: it features orange, white, and black tufts of hairs. 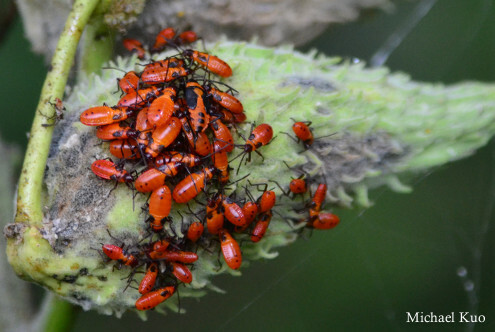 Oleander aphids are not exclusive to milkweeds (in fact they're named for their frequent association with oleander), but they are often found on milkweeds—and when they're there, look out! They can cover virtually an entire plant. They are about 2 mm long, and feature orangish yellow, bloated-looking bodies with black appendages. 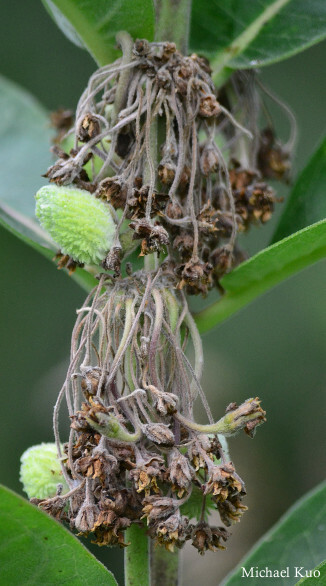 oleander aphids on a common milkweed seedpod . . .
References: GN Jones 1971, Wilkinson & Jaques 1972, Bland & Jaques 1978, Arnett et al. 1980, Milne & Milne 1980, Kricher & Morrison 1988, RL Jones 2005, Voss & Reznicek 2012, Kurz 2014, Mohlenbrock 2014, Hilty 2017, ISU 2017, Lotts & Naberhaus 2017, USDA 2017, Zaya et al. 2017. All text and images © , midwestnaturalist.com.